Seasons Greetings from the Changi Archive Conservators! 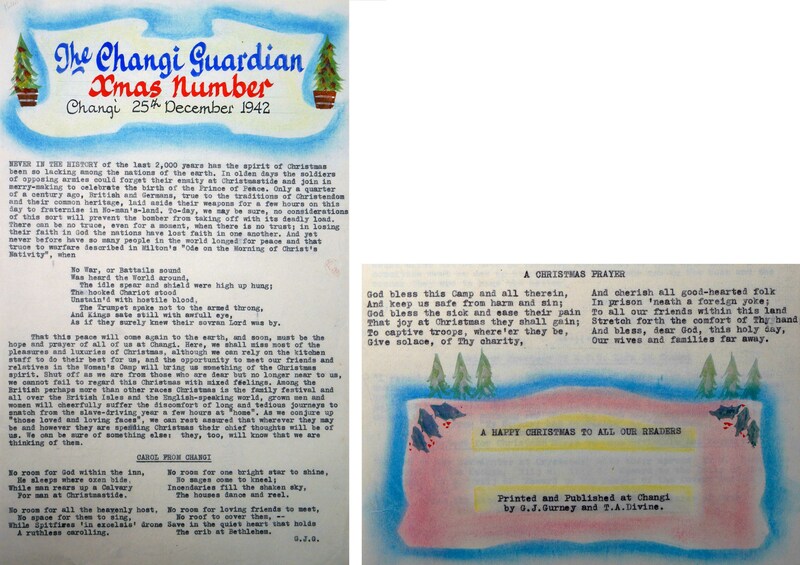 As we prepare to celebrate the holiday season at home with family and friends, we have been struck by the courage with which the civilian internees of Changi Gaol marked their first Christmas. As no contact was permitted between husbands, wives and children for the first fifteen months of imprisonment, Christmas 1942 saw imprisoned families separated from one another. Nothing gives more of an insight into the struggles and incredible resilience shown by the internees than the camp newspapers. Since commencing the conservation of the Changi Archive two and a half months ago we have completed the conservation for digitisation of both camp newspapers, The Changi Guardian and The Changi Chimes. The newspapers ranged from 1 to 3 pages in length and offered a way for internees to share information, notices and letters. They also featured stories, poems, and quizzes contributed to by everyone in the camp. The Changi Guardian was published three times a week and The Changi Chimes, described in The Changi Guardian as ‘crisp, bright, camp-flavoured prose, verse, limericks, jokes, etc.’ was published each Sunday. The newspapers were written and produced in the camp by internees H. Miller and G. H. Wade with contributions from other internees. 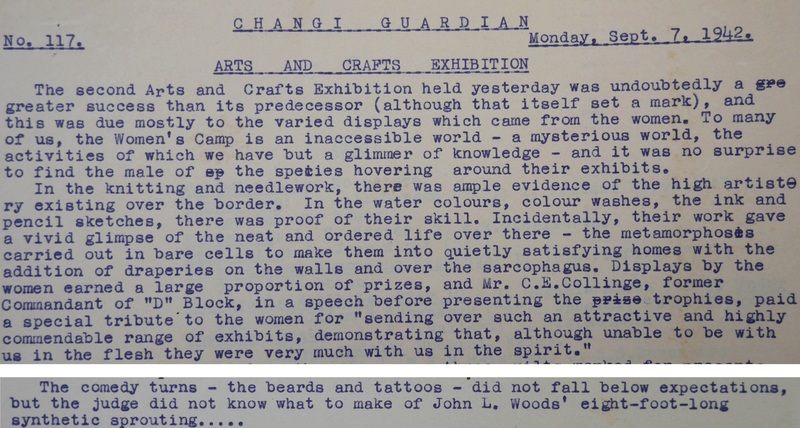 The papers offer interesting snippets of daily life, such as the review of an Arts and Crafts Exhibition. 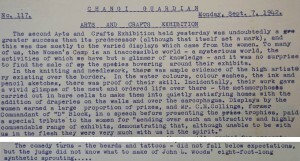 The entry begins by describing the excitement of the male internees upon witnessing needlework, paintings and sketches which had been sent over the wall from the women’s camp, described in the article as ‘an inaccessible world – a mysterious world, the activities of which we have but a glimmer of knowledge’. Having had no contact for 6 months by this stage, the men lamented the lack of contact and stated that although the women ‘were unable to be with us in the flesh they were very much with us in the spirit’. The article ends with an observation that the beards and tattoos category did not fall below expectations with the judge not knowing what to make of ‘John L. Woods’ eight-foot-long synthetic sprouting’. These humorous entries capture the amazing spirit of the internees despite their difficult circumstances and daily struggles. Morale was especially present in the paper published on Christmas Day 1942, the internees first Christmas in the camp. 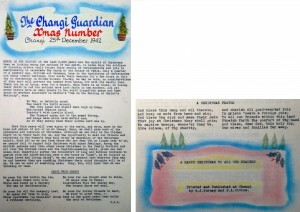 They managed to obtain coloured pencils and paints and these were used to decorate the Christmas edition of The Changi Guardian. The paper begins with a reflection on the sorry state of the world and ends with a prayer asking God to give solace to sick and captive troops and to bless the internees ‘wives and families far away’. The Japanese invasion of Malaya began in December 1941 and culminated in the fall of Singapore in February 1942. Captured civilians were interned in Changi Gaol in March. Two months later in May they were surprised by the much delayed arrival of a Christmas pudding. To celebrate the event The Changi Chimes set a Christmas pudding verse competition which received enthusiastic responses, the winner of which is pictured below. Quizzes were a regular feature in the camp newspapers one of which is pictured on the left. Can you solve it? Why not print a copy, take it home for Christmas, and test your family and friends. We will reveal the answers in a separate blog post in the New Year. Good luck! Wishing you all a very Merry Christmas and a Happy New Year 2016.